Oak MFC tops with silver metal legs. Banks of 6 persons (4800w x 1600d mm) £525+VAT each. 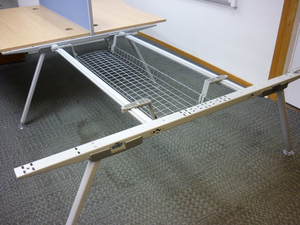 Banks of 4 persons (3200w x 1600d mm) £375+VAT each. Banks of 2 persons (1600w x 1600d mm) £200+ VAT each.